Munroe works in a wide variety of media, including paint, silverpoint, and collage. Her works are included in major museums, such the National Museum of American Art, the Smithsonian Institution, and the Brooklyn Museum. She is also a freelance garden and art writer. 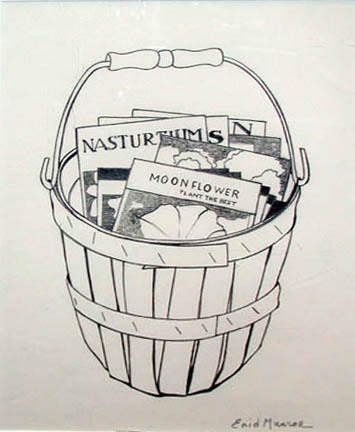 Munroe, Enid, “Basket of Seeds,” Westport Public Schools Digital Collections, accessed April 25, 2019, https://collections.westportps.org/items/show/1054.